These two decisions: Family and Career (outside of your decision to come to faith in Jesus) are the most important in terms of happiness, success and witness in this life. You don’t want to mess them up. My advice to you? Bathe These (and all) Key Decisions in Prayer! Now why did Jacob center in on the younger of Laban’s daughters? There is a clue in their names. Rachel’s name meant Ewe or Lamb. Leah’s name meant “Weary” or “Cow.” There are also clues in the text of Scripture. Rachel was beautiful of form and face we are told. Leah had “tender” or “weak” eyes. Some commentators try to say that this was said to mean a redeeming feature. But it seems in the text that her “weak” eyes were in contrast to Rachel’s beauty. Perhaps she was cross-eyed or had bulging eyes. Whatever the case… this is not a flattering description. So Jacob says: “I’ll take Rachel.” And then he rolls up his sleeves and gets to work… and the years seem to fly by. Soon the 7 years are up. 21 Then Jacob said to Laban, “Give me my wife, for my time is completed, that I may go in to her.” 22 Laban gathered all the men of the place and made a feast. 23 Now in the evening he took his daughter Leah, and brought her to him; and Jacob went in to her. 24 Laban also gave his maid Zilpah to his daughter Leah as a maid. 25 So it came about in the morning that, behold, it was Leah! And he said to Laban, “What is this you have done to me? Was it not for Rachel that I served with you? Why then have you deceived me?” 26 But Laban said, “It is not the practice in our place to marry off the younger before the firstborn. Let’s talk marriage first. Before you Spin the Wheel in the game of life and put that little peg spouse in the seat beside you… you better do some serious praying! We can be so sloppy in the pursuit of a mate… out of desperation or whatever. Before you “wink the eye” and lay a trap for Mr or Mrs Right… invite God into your search. This chapter parallels another story in the book of Genesis. In Chapter 24 Abraham is concerned about finding a wife for his son Isaac. That story follows the same pattern as this one. Only in the earlier story, Abraham sends a servant to find Isaac’s bride. That servant went to the city’s well. There he found the future Mrs. Isaac. He heads to the girl’s home where he is met with approval from the papa. Ultimately he brings Isaac his Rebekah. There are subsequently wedding bells chiming. There is a major difference in these two stories. In the story of the servant… the whole process was bathed in prayer. In chapter 24 Abraham invokes God when he charges his servant with the task of matchmaking. The servant prays to God to help him find the right girl as the girls of the city come out to draw water. When he finds Rebekah he utters a prayer of thanksgiving. And when she finally agrees to go with him (for her daddy seemed reluctant) the Scripture says: “he bowed himself to the ground before the Lord.” Move back to chapter 29. There is no indication that Jacob prayed for or thanked God for anything in his entire wife seeking experience. What would have happened if Jacob had prayed first? 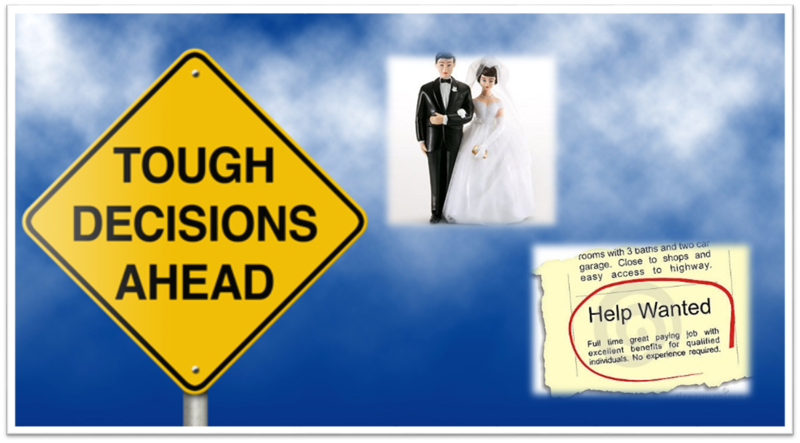 Have a major decision in your life regarding a relationship or a job change? Have you spent the time you need on your knees before God? He sees down the road far better than we can.